Emergency aid is finally trickling through to thousands of people stranded by the devastating tsunami which struck the western Solomon Islands. At least 22 people died in Monday's disaster but the toll is set to rise, as many others are still missing. Thousands of residents of Gizo town are now homeless, and many of them are due to spend a second night sleeping in the open in hills behind the town. A series of aftershocks has shaken the isolated region still further. The 8.0-magnitude undersea quake struck at 0740 local time on Monday (2040 GMT Sunday), and was followed by a tsunami which brought huge waves crashing down on the coastline of this remote Pacific region. Hundreds of coastal homes, many made of palm and bamboo, did not stand a chance against the double onslaught. "There are many of us here, people are afraid to leave the higher ground"
Eyewitness account - "Our most urgent need is for water. We have no water at all. The water tanks have collapsed. Then we need food. For now we sit outside and wait for the danger to go away and for help to reach us. We are really scared. We don't know what's to come. We have seen these kind of things happening to other people on our TV screens. We thought we were safe but now it has happened to us, too." 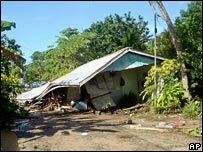 An Australian quake expert says the Solomon Islands should brace for another big earthquake in the next few weeks. "I have just gone through my records of earthquakes in the Solomon Islands region and although we have earthquakes of magnitude seven and above ... we've never had a magnitude of just over eight before. Any earthquake of that magnitude would have aftershocks for days and weeks." "One of the characteristics of this area is that you will often get days or weeks or even a couple of months later, another big earthquake. "There is absolutely no way of knowing for sure, but there is a significant chance of another big one.'' "One side of the fault ruptured on a fault break that was probably 100 kilometres long or more and 100 kilometres deep. One side moved about two or three metres relative to the other. It's a big earthquake by normal standards. But the Sumatra earthquake was gigantic. It was over 1,000 kilometres long by a couple of hundred kilometres deep."